A few words with Timothy Verdon - Florence is You! Its reopening was eagerly awaited and, after two years of meticulous work, Opera del Duomo Museum was promptly revealed to us with a completely renewed architectural aspect, with an exhibit that leaves its mark, with a strong history and an exceptional heritage: the world’s largest collection of sacred medieval and Florentine Renaissance art and sculpture. The Opera di Santa Maria del Fiore was founded in 1296 in order to build the Cathedral of Florence and since then is responsible for its conservation and enhancement; for the construction of the new museum it has invested 45 million euro from personal resources, without any public contribution, creating a monumental work from whatever perspective you look at it. Knowing the director of the museum, Monsignor Timothy Verdon, and listening to his lively words about the story of such an extraordinary museum it’s a great privilege and for that I must thank him. What should the visitors of the new Opera del Duomo Museum expect? An innovative and spectacular exhibit capable to increase the value of masterpieces unique in the world such as Michelangelo’s Pieta, Donatello’s Mary Magdalene and the Prophets, the Choir by Luca della Robbia and Donatello, the Lorenzo Ghiberti’s Gate of Paradise and Northen Gate. 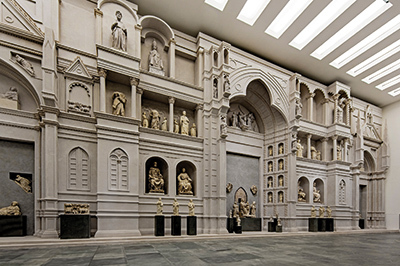 The museum gathers in its twenty-five rooms, some of them of gigantic dimensions (twenty to almost forty meters long and with ceilings ranging between six and eighteen meters), masterpieces by Giotto, Donatello, Michelangelo, Filippo Brunelleschi, Luca della Robbia, Arnolfo di Cambio, Andrea Pisano, Antonio Pollaiuolo, Ghirlandaio, Andrea del Verrocchio and many more. An exhibit space that has doubled its size: we have a beloved museum that was founded in 1891, in which the large statues, designed for the exterior of the Cathedral, the Baptistery and the Bell Tower, were sacrificed; now, in the 5.500 square meters exhibition space, we have presented an ideal reconstruction on a spiritual, historic, artistic, scientific and technological plan all around the complex museum. In fact, the Opera del Duomo Museum is part of a museum system that includes the Cathedral, the Baptistery of St. John, Giotto’s Bell Tower, Brunelleschi’s Dome, the Crypt of Santa Reparata. A highly technological museum where the visitor will find a lot of video materials that will help them understand together with the Italian and English legends. A great museum, unique in its authenticity, art and history, the beating heart of Florence. According to you what will catch our attention more? A major attraction will be the first room of the Museum where, based on a sixteen century drawing by Bernardino Poccetti, has been rebuilt the old medieval facade of the cathedral built by Arnolfo di Cambio, a facade that was never finished and was destroyed in 1587. It is a colossal life-size model, made of resin and marble dust, on which were relocated, in their original position, the sculptures that still existed. In front of this titanic structure there have been placed in the positions indicated by the drawings of the sixteen century, the forty statues from the fourteenth and early fifteenth century that were originally made for this place by the fourteenth-century masters. 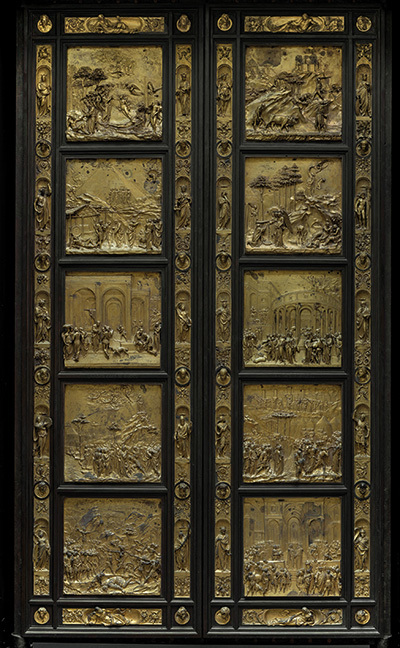 Across the room, exactly as it would have been the case until the dismantling of the facade, there are the majestic bronze doors by Lorenzo Ghiberti for the Baptistery of San Giovanni, the Gate of Paradise and North Gate, restored by the Opificio delle Pietre Dure, while the South Gate of Andrea Pisano will arrive in 2017, after restoration. In this way we have reunited works of art that were conceived to be together but that for reasons of conservation or in the course of changes and modernization, had later been removed from the original location. The monumental exhibition intends to rebuild a relationship and visual iconography that was lost for over four hundred years, resuming the dialogue between the Cathedral, the Baptistery and their sculptural treasures, and also between the Antiquity, the Middle Ages, the Renaissance and Mannerism. In the new museum are also incorporated works of art that had never been exposed and that were kept in storage thus leading everything to a result of high-impact, both visually and emotionally. A museum in the museum is represented by the Gallery of the Dome by Brunelleschi (1418-1436) with the wooden models of the fifteenth century, including one attributed to Brunelleschi, and containing materials and tools of the time used for the construction of the dome. Sculpture is the highlight of the collection. Donatello’s Maddalena Penitente and Michelangelo’s Pietà represent undisputable masterpieces of the universal art but they are also an expression of profound spirituality. 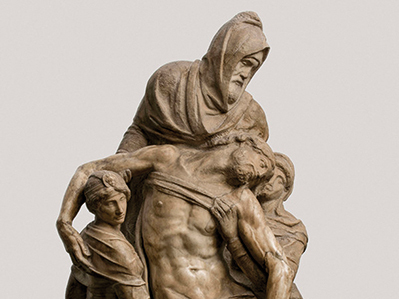 From the first spectacular environment, the museum’s path continues in its halls that host works of great spiritual impact for the collection: Donatello’s Maddalena (1453-55) and Michelangelo’s Pietà (1547-1555). The Maddalena is an elderly woman so thin who is barely able to stand on her feet. At the same time she emanates a great inner strength, noticeable in her eyes, full of tenderness and great devotion through her hands that are going to unite in prayer. Michelangelo’s Pietà is one of the most mysterious works of the artist, perhaps intended for his tomb. Michelangelo in a time of great distress tried to destroy it with a hammer. What we did is an “act of restitution” of the works that were intended for the cathedral, which have the opportunity to speak their language, to tell their stories; we give back to artists and patrons, the Florentines of those times, the ability to forcefully communicate the message that they wanted to convey through their works, recovering the religious, historical and artistic significance of the masterpieces. They are works of art of unparalleled quality that have changed the vision and the way to create of the artists, in which we can see a cultural, social and political plot, but most of all a spiritual history and a testimony of faith. I am very excited. It is since 2011 that I think about the detailed arrangement of every space of the Museum and I must thank the Opera del Duomo and architects Adolfo Natalini, Piero Guicciardini and Marco Magni for the architectural solutions that have allowed for my vision of the museum to take shape and materialize before my eyes. All the works of the Museum have found a new location and they constitute an extraordinary tale of sacred and secular events related to the museum complex in its entirety. I was struck by the hills, the cypress trees; I lived in Fiesole and I saw Florence wrapped in an ancient poem, the same poem that can still seize you today when you wake up early in the morning and walk through the streets of the historical center, not crowded yet, but uniquely framed by the lovely morning light. La sua riapertura era molto attesa e, dopo due anni di meticoloso lavoro, puntualmente, il Museo dell’Opera del Duomo di Firenze si è svelato ai nostri occhi completamente rinnovato nell’aspetto architettonico, con un allestimento che lascia il segno, forte di una storia e di un patrimonio eccezionali: la maggiore collezione al mondo di arte e scultura sacra medievale e rinascimentale fiorentina. L’Opera di Santa Maria del Fiore è stata fondata nel 1296 per costruire il Duomo di Firenze e da allora si occupa della sua conservazione e valorizzazione; per la realizzazione del nuovo Museo ha investito ben 45 milioni di euro di risorse proprie, senza alcun contributo pubblico, realizzando un’opera monumentale da qualunque prospettiva si osservi. Conoscere il direttore del Museo, Monsignor Timothy Verdon, e poter ascoltare dalle sue vivaci parole la storia di un museo così straordinario, è un grande privilegio e per questo lo ringrazio. Cosa devono aspettarsi i visitatori del nuovo Museo dell’Opera del Duomo? Un innovativo e spettacolare allestimento in grado di valorizzare capolavori unici al mondo come la Pietà di Michelangelo, la Maddalena e i Profeti di Donatello, le Cantorie di Luca della Robbia e Donatello, la Porta del Paradiso e la Porta Nord di Lorenzo Ghiberti. Il Museo raccoglie nelle sue venticinque sale, alcune delle quali di dimensioni gigantesche (lunghe da venti a quasi quaranta metri e con soffitti che vanno da sei a diciotto metri), capolavori assoluti di Giotto, Donatello, Michelangelo, Filippo Brunelleschi, Luca della Robbia, Arnolfo di Cambio, Andrea Pisano, Antonio Pollaiuolo, Ghirlandaio, Andrea del Verrocchio e molti altri ancora. Uno spazio espositivo che è più che raddoppiato: avevamo un museo molto amato che è stato fondato nel 1891, nel quale però le grandi statue, concepite per gli esterni del Duomo, del Battistero e del Campanile, risultavano sacrificate; adesso nei 5.500 metri quadrati di esposizione abbiamo presentato una ricostruzione ideale sul piano spirituale, storico, artistico, scientifico e tecnologico di tutto il complesso museale. Il Museo dell’Opera del Duomo, infatti, fa parte di un sistema museale che comprende la Cattedrale, il Battistero di San Giovanni, il Campanile di Giotto, la Cupola del Brunelleschi, la Cripta di Santa Reparata. Un museo fortemente tecnologico, nel quale il visitatore troverà molti filmati che lo aiuteranno nella comprensione, con legende in italiano e inglese. Un unico grande museo, un unicum di fede, arte e storia, il cuore pulsante di Firenze. Secondo Lei cosa colpirà maggiormente la nostra attenzione? Una grande attrazione sarà già nella prima sala del Museo dove, sulla base di un disegno cinquecentesco di Bernardino Poccetti, è stata ricostruita l’antica facciata medievale del Duomo realizzata da Arnolfo di Cambio, facciata mai finita e distrutta nel 1587. Si tratta di un colossale modello a grandezza naturale, realizzato in resina e polvere di marmo, sul quale sono stati ricollocati, nella posizione originaria, i gruppi scultorei ancora esistenti. Davanti a questa titanica struttura sono state collocate, nelle posizioni indicate nel disegno cinquecentesco, le quaranta statue del Trecento e primo Quattrocento che erano state originariamente realizzate per questo luogo dai maestri trecenteschi. Sul lato opposto della sala, esattamente come sarebbe avvenuto fino allo smantellamento della facciata, si trovano le maestose porte bronzee realizzate da Lorenzo Ghiberti per il Battistero di San Giovanni, la Porta del Paradiso e la Porta Nord, restaurate dall’Opificio delle Pietre Dure, mentre la Porta Sud di Andrea Pisano arriverà nel 2017, dopo il restauro. In questo modo abbiamo riunito opere che erano concepite per stare insieme ma che, successivamente, per motivi di conservazione o nel corso di modifiche ed ammodernamenti, erano state rimosse dalla collocazione originale. Il monumentale allestimento intende ricostruire un rapporto visivo e iconografico che era perduto da oltre quattrocento anni, riattivando il dialogo tra la Cattedrale, il Battistero ed i rispettivi tesori scultorei, ed anche tra l’Antichità, il Medioevo, il primo Rinascimento e la Maniera. Nel nuovo museo confluiscono anche opere che non erano mai state esposte e che erano conservate nei depositi e tutto ciò determina un risultato di grande impatto, visivo ed emotivo. Un museo nel museo è rappresentato dalla Galleria della Cupola del Brunelleschi (1418-1436) con i modelli lignei del Quattrocento, tra cui quello attribuito allo stesso Brunelleschi, e contenente materiali e attrezzi dell’epoca utilizzati per la costruzione della Cupola. La scultura è il fiore all’occhiello della collezione. La Maddalena Penitente di Donatello e la Pietà di Michelangelo rappresentano capolavori indiscussi dell’arte universale ma sono anche espressione di profonda spiritualità. 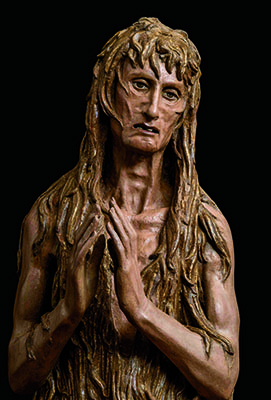 Dal primo spettacolare ambiente, il percorso museale prosegue proprio nelle sale che ospitano le opere di maggiore impatto spirituale della raccolta: la Maddalena Penitente di Donatello (1453-55) e la Pietà di Michelangelo (1547-1555). La Maddalena rappresenta una donna anziana così esile da reggersi appena sui piedi. 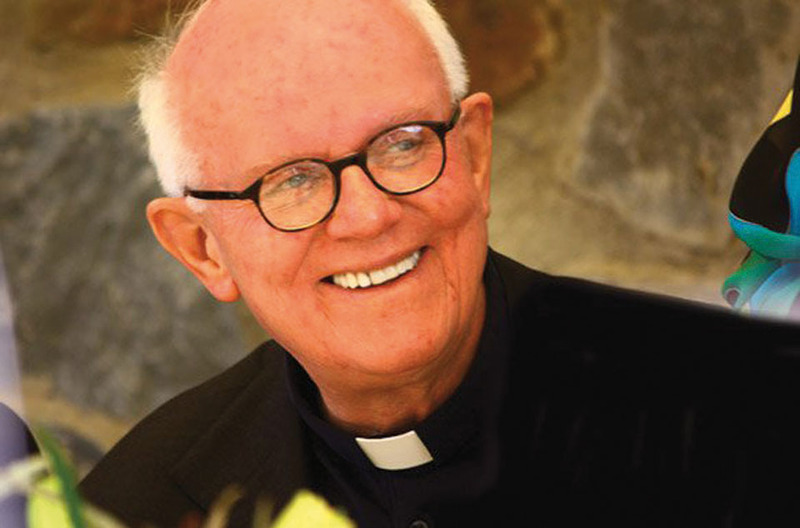 Allo stesso momento sprigiona una grande forza interiore, avvertibile nello sguardo pieno di tenerezza e devozione e nella mani che stanno per giungersi in preghiera. La Pietà di Michelangelo è una delle opere più misteriose dell’artista, forse destinata al suo monumento funebre. Michelangelo in un momento di grande sconforto tentò di distruggerla a martellate. Il nostro è un “atto di restituzione” alle opere che erano state realizzate per il Duomo, che hanno così la possibilità di parlare la loro lingua, di raccontarsi; restituiamo agli artisti ed ai committenti, i fiorentini di allora, la possibilità di comunicare con forza il messaggio che hanno voluto trasmettere attraverso le opere, recuperando il significato religioso, storico e artistico di capolavori assoluti. Opere di qualità impareggiabile che hanno cambiato il modo di vedere ed operare degli artisti, nelle quali possiamo cogliere una trama culturale, sociale e politica, ma soprattutto una storia spirituale e testimonianza di fede. Qual è il suo stato d’animo in questo momento? Sono molto emozionato. È dal 2011 che penso alla disposizione dettagliata di ogni ambiente del Museo e devo ringraziare l’Opera del Duomo e gli architetti Adolfo Natalini, Piero Guicciardini e Marco Magni per le soluzioni architettoniche che hanno permesso alla mia visione del Museo di prendere corpo e di concretizzarsi davanti ai miei occhi. Tutte le opere del Museo hanno trovato una nuova collocazione e costituiscono uno straordinario racconto delle vicende sacre e profane legate al complesso museale nella sua interezza. È un legame molto forte. Sono giunto a Firenze nel 1965 e da allora ho sempre vissuto qui. Ricordo che quando giunsi a Firenze, dopo un anno di studio trascorso a Venezia per la stesura della tesi di dottorato a Yale in storia dell’arte, mi colpirono le colline, i cipressi; allora abitavo a Fiesole e vedevo Firenze avvolta da una poesia antica, quella stessa poesia che puoi cogliere ancora oggi quando ti svegli presto la mattina e percorri le vie del centro storico non ancora affollato ma incorniciato unicamente dalla deliziosa luce del mattino. Museo dell’Opera del Duomo, after the renewal , is one of the most beautiful museum in the entire world. Believe me. 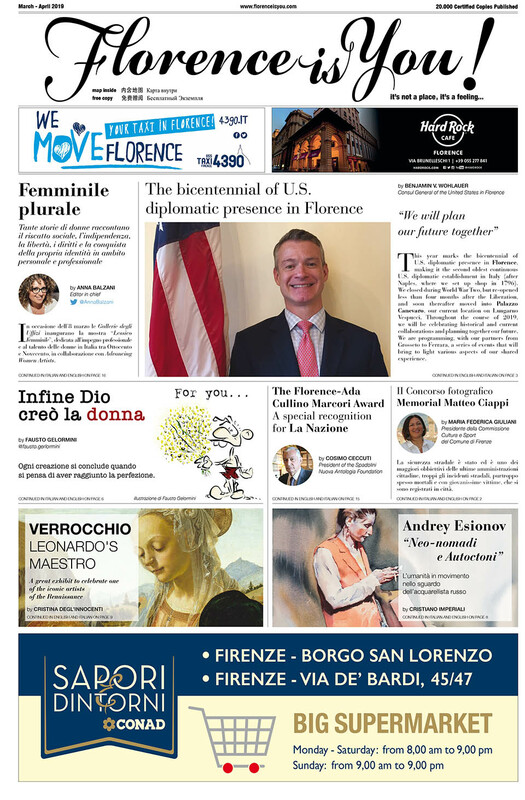 I had the privilege to visti it together with my teacher of Italian of “my” favourite school, Scuola Toscana in Florence, a very nice and reliable school of Italian language. With this competent teacher we explore many masterpieces – wow! Rome is wonderful, but Florence has its special Renaissance taste….do not loose the new museum, do not forget that with this ticket you can also visit the Battistero and the Campanile di Giotto.